If uniqueness is what attracts you, this Decorative Scone wall mount is what you should invest in. This piece is designed from finest brass sheets with traditional hammering, beating and bashing. With a dainty floral pattern surrounding the lid is what adds to its aesthetic beauty. You can use this scone in HOME Decor or Living area decor or can be a perfect gift item. 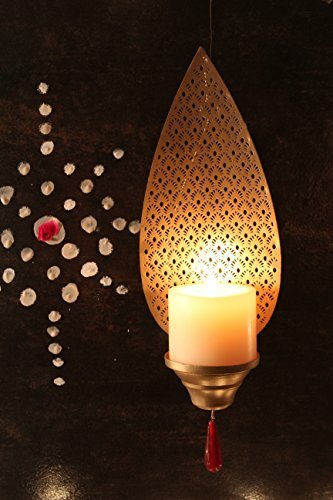 Use a pillar or remote flameless LED candle, and watch the soft glow of light play beautifully off of the sconces. Works perfectly with modern, industrial, Art Deco and contemporary decor. CLASSIC DESIGN & MULTIPLE USES: A gold burnished scone is handcrafted product that can be used on a wall, pillar as decoration item. Enhance your wall with this scone . As a decorative items, this golden color scone looks equally impressive whether placed in a home , temple or restaurant. Add some earthy glow to your interior and bedazzle your guests with its elegant looks. PURE BRASS METAL & COMPACT SIZE: Made of 100% Brass metal sheet. HANDMADE, DURABLE & ECO-FRIENDLY: This handcrafted brass-ware has been crafted by skilled artisans from India. This product is Earth friendly, non-breakable & corrosion resistant. The matt finish of this handcrafted list and scone will remain the same for decades to come. If you have any questions about this product by Courtyard, contact us by completing and submitting the form below. If you are looking for a specif part number, please include it with your message.